"Circus at Wise Fool is a combination of everything I love to do; spend time with really cool people, do crazy fun activities, and explore new things. I am infinitely happy I found Wise Fool." "The stretching, acrobatics, climbing, running, and laughing have all been positive influences on not just our child but for her younger sibling and her friends. She is eager to try new tricks, to help her friends learn new skills, and is more appreciative of creative movement." "The camps were hands down one of the best summer experiences ...The atmosphere was always sweet and happy - time for play and learning amazing things from the amazing young and vibrant teaching staff. The role models for my daughter could not have been better." Wise Fool spring, summer, and winter break camps allow your kiddos to run away with the circus, without leaving home! Students learn stilt-walking, unicycling, aerial fabric, trapeze, juggling, puppet-making, clowning and more! All in a safe, non-competitive environment. Camps fill up quickly, email youth@wisefoolnm.org to get on our mailing list to find out about camp registration. Registration is open for Summer Camps! Click HERE for registration instructions. March 18-22. For students ages 7-12. No experience necessary. Camp runs 9am to 3:30pm. Cost is $285 for the week. June 17-21, for students ages 5-7. No experience necessary. Camp runs 9am-12:30pm. Cost is $260 for the week. No experience necessary. Registration will open November 1st. Camp runs 9am to 3:30pm, with before & aftercare options. 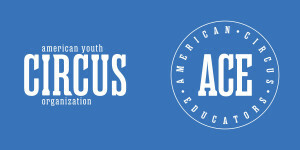 Tuition assistance available! 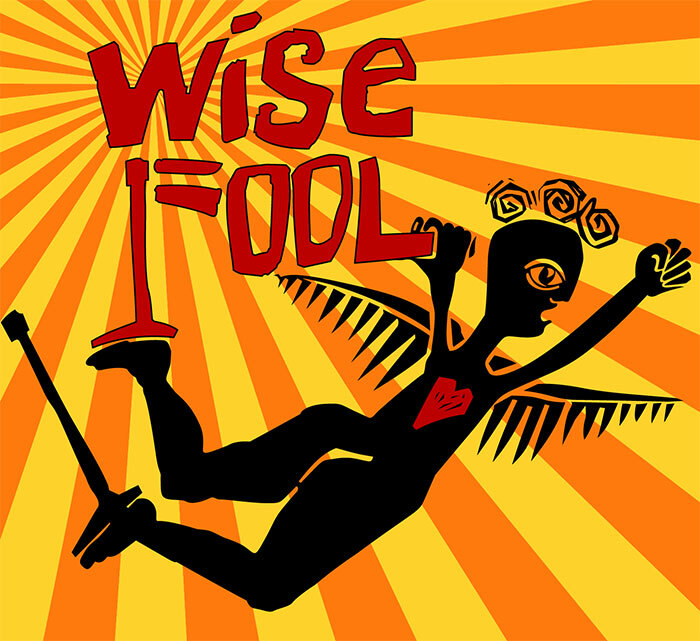 Wise Fool has offered afterschool classes for local youth since 2004! Afterschool classes include instruction in aerial fabric, trapeze, stilt-walking, clowning, unicycling, juggling, acrobatics & more! See below for programming for youth ages 4 - 12. Spring 2019 Session Runs January 14 to April 26, with a pause for spring break March 18 to 22. Costs for classes listed below. Remember scholarships and payment plans are available! $185 for 14 week session. For kiddos in pre-k or Kinder/1st, no experience necessary. Students will work on creative movement, aerial fabric, trapeze, obstacle courses, physical literacy, and have lots of fun jumping in, through, and on hoops! $250 for 14 week session. Suitable for youth ages 7-12! We will teach to youth of all levels in this class who want to learn and play in circus. 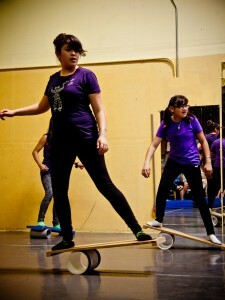 Youth get to try stilt-walking, aerial fabric, trapeze, acrobalance and clowning in a safe and supportive environment. They will show their skills to parents and friends on the last day of class. $465 for 14 week session. For kids ages 8 to 12 who have taken at least one session of Afterschool Fools or a session of summer camp and want to dedicate themselves more seriously to circus, by coming twice a week. Youth pick a few disciplines to focus in and deepen their skills in performance, conditioning, and flexibility, all within a safe and supportive environment. They will show their skills to parents and friends on the last day of class. Saturdays: 10am - 11:30 am, runs on an ongoing basis. Please check the studio calendar to see if class is on this week. A great chance for kids with a passion for aerials to try or develop further skills in trapeze and aerial fabric. Suitable for kids ages 7 - 12 of all experience levels. Drop-ins allowed! Please email studio@wisefoolnm.org or text 505-206-0160 if you are planning to drop in. Tuesdays 10-11:30am. 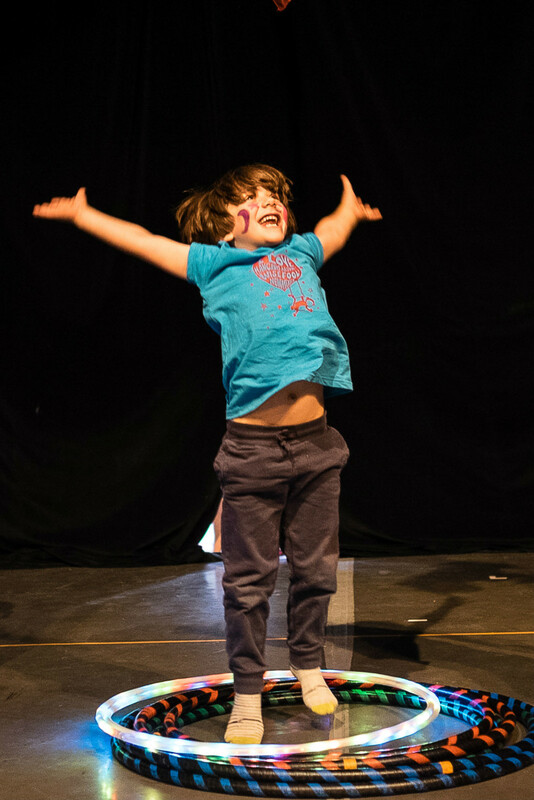 Circus jam where parents and children (ages 2-6+) play in the circus together! Families get to try stilt-walking, juggling, tumbling, partner acrobatics, hoola hoops, aerial fabric, and trapeze in a safe and supportive environment. This class is an open studio format where Wise Fool coaches will be on hand to support family play and experimentation. No experience necessary! $12 drop in for one adult and one child. Additional children are $5 each class. If you'd like to apply for a scholarship, please click on the button below to apply. Scholarship decisions are made at least one week before the start of the program. Youth ages 12 - 16 are invited to take a number of our ongoing classes. See below for the current schedule. Youth ages 16 + are invited to take any of our drop-in studio classes. Please see the full schedule here. Please contact studio@wisefoolnm.org before attending your first class. 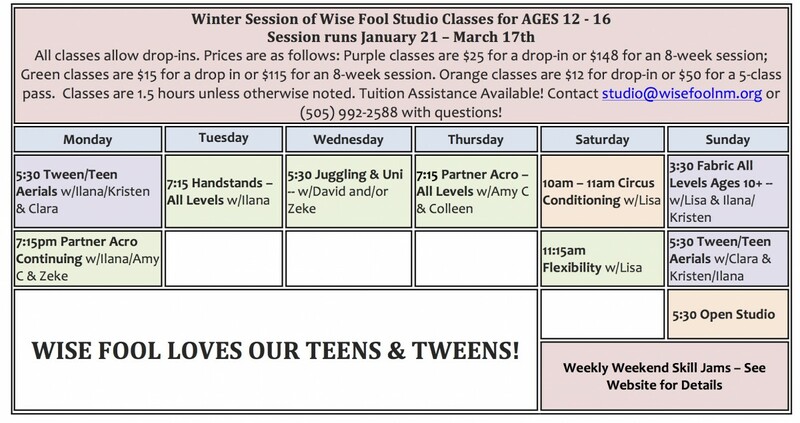 Wise Fool is now offering our Teen Troupe on an ongoing basis! This class is for older students ages 13-18 who have done a minimum of one year of programming with Wise Fool. When teens sign up for Teen Troupe, they commit to taking one adult class in the discipline of their choice (i.e. fabric, trapeze, acrobalance, unicycling, etc.) each week. During the summer, students can also take a conditioning, flexibility or acro class, and practice their skills in open studio. During the school year, students meet on Tuesdays 5-7pm as a group to explore performance skills, develop strength and flexibility. Cost is a sliding scale based on income from $15 - $125 per month. If your youth is interested in Teen Troupe please email Ilana at studio@wisefoolnm.org or call 505-310-9723. Teens will take one adult class in their area of specialization and will meet once a week as an ensemble to work on physical conditioning, stiltwalking, performance skills and act development. Troupe members will have the opportunity to showcase these skills in community performances, thereby getting a taste for the life as a professional circus artist! In addition to learning higher-level skills, students will have the opportunity to participate in paid performances for the community. The money from these performances supplements the costs of tuition and scholarships for students. TeenBUST brings middle school girls together in a community that supports taking risks, pushing boundaries, and becoming physically bold. Mornings, the girls work with professional instructors of circus techniques, learning to articulate their unique voices and bodies. Afternoons, the girls journal their experiences and workshop with visiting organization to further their growing repertoire of skills in self-advocacy, community and leadership. With Teen BUST, girls are challenged, have fun, and explore new ideas as they become bolder and stronger versions of themselves, ready to support each other as they navigate and impact their complex worlds. 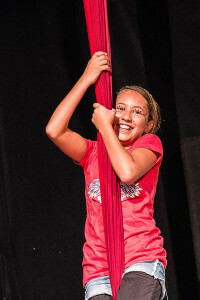 Learning circus skills and puppetry is not only fun, it helps youth to develop self confidence, learn and practice teamwork and mutual respect, develop trust in themselves and others, explore their unique self-expression, and develop belief in their ability as artists and performers. It also provides non-competitive physical activity and helps youth develop a positive relationship with their bodies through balance, physical strength, and healthy risk-taking. And did we mention that it's fun?! 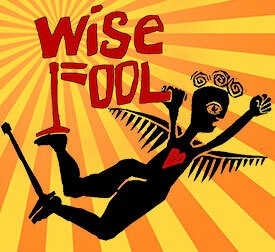 In addition to our on-site programs listed below, Wise Fool works extensively in area schools. For more information, please contact our Youth Programs Coordinator, Alanna Herrera at youth@wisefoolnm.org. 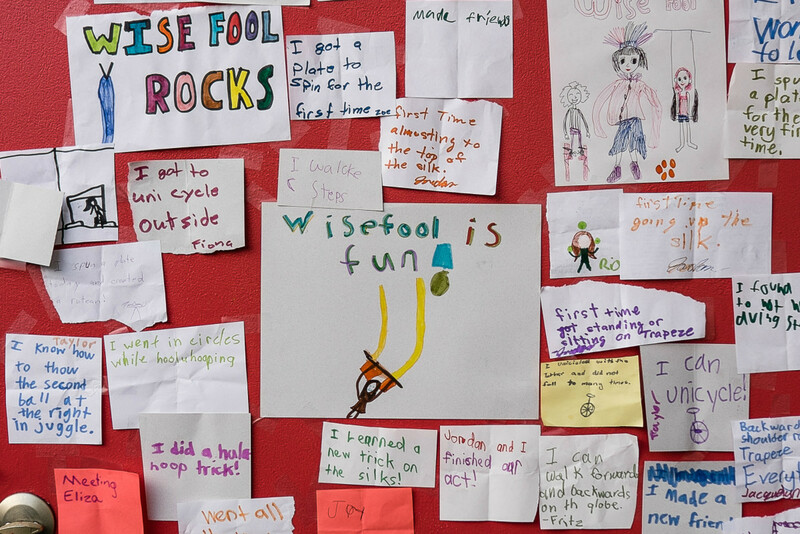 Wise Fool teachers, all of whom attend annual unlearning oppression trainings, create a safe and supportive environment for students of all ages to take risks, connect with one another, and exceed their perceived personal limits. Wise Fool teachers lead trust-building and group-negotiation games as part of every program, and urge students to break free, tell their stories, and celebrate their unique self-expression through performance, often with profound, moving, and hilarious results. Staff and Teacher bios can be found on our Wise Fool People page! All participants in Wise Fool's Youth Programs are asked to follow these policies (download here) to keep our programs safe, positive, supportive, and beneficial for everyone involved! Parents sign an acknowledgement of these policies when enrolling their youth in our programs. Contact Alanna Herrera, Youth Programs Director at 505-992-2588 or youth@wisefoolnm.org for more information!